On March 3, 1991, officers from the Los Angeles Police Department (LAPD) stopped motorist Rodney King for a traffic violation. During the arrest proceedings, King was struck over fifty times with nightsticks after initially resisting police orders. A witness to the event, George Holliday, videotaped the arrest, which was later broadcast on local station KTLA and commercial news networks nationwide. Within a week following the incident, a Grand Jury returned indictments against the officers involved in the arrest for the use of excessive force and assault with a deadly weapon. Over a year after the night of the beating, the LAPD officers indicted in the trial were acquitted of the charges brought against them. As a result of the verdict, many residents of Los Angeles reacted with shock and anger. Some residents took to the streets to protest; others turned to their televisions to watch events unfold. From April 29 through May 15, 1992, television networks devoted extensive resources and airtime to the uprising. The center of much of the resulting activity took place in the South-Central area of Los Angeles, with events spreading rapidly across many parts of the city. 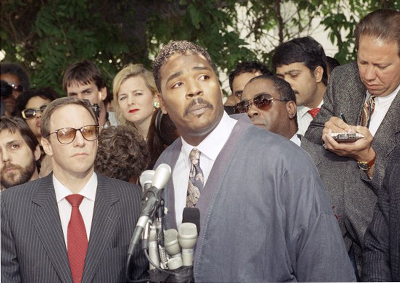 UCLA Film & Television Archive's News and Public Affairs Collection (NAPA) holds extensive television news coverage related to the Rodney King case and the events of the Los Angeles uprising. This material is available for on-site viewing at UCLA by advance arrangement through the Archive Research and Study Center. For more information about the NAPA collection, please visit our NAPA page or contact the Archive Research and Study Center at 310-206-5388 or arsc@cinema.ucla.edu.